More than ever, the Market Research Industry is experiencing change. New technology. Challenging and uncertain economic times. The need to do more with less. The 2014 Annual Survey of Market Research Professionals is based upon the attitudes and opinions of 606 Market research professionals. Each invited participant completed our online survey between January 23 and February 13, 2014. The aggregate results have a data tolerance of +/- 4.0% at the 95% confidence level and include many questions from the 2013, 2012, 2011, 2010, 2009, 2008, 2007, and 2005 research initiatives -- providing an invaluable longitudinal perspective. This new in-depth, 68 page report is available for $499. To purchase, open an employer account, select "Pricing Plans" and choose the "2014 Annual Survey of Market Research Professionals." The report will be emailed to you within 30 minutes after your purchase. 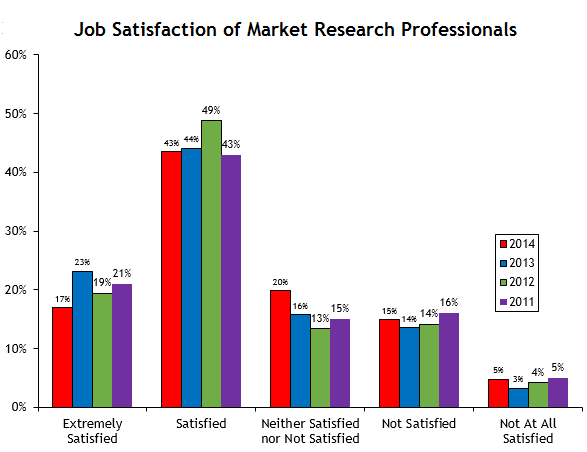 Down by seven percentage points in just one year, market research professionals are significantly less satisfied with their current job. All managers across all types and sizes of companies should take note of this important metric. The in-depth report identifies those who are most satisfied and those who are at risk of finding another position. While the "typical" market research professional currently earns $103,349, salaries only increased 0.7% during the past year. Fortunately bonuses have increased to help drive morale and encourage employee retention. For additional compensation information revealing the impact of experience level and role as well as forward looking expectations, please see the detailed report. Without a doubt, the methods used to survey consumers and business professionals have changed over time. The chart below reveals a nearly decade-long trend and quantifies the underlying changes. In particular, use of mail and telephone surveys continue their gradual decline. 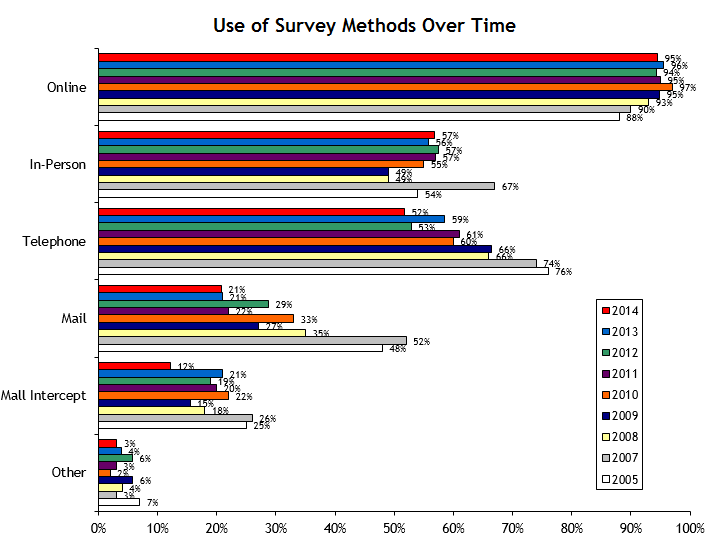 And most notably this year, mall intercept surveys have experienced a sharp decline in usage. Up next to change the surveying landscape -- mobile technology. Today, the majority of researchers are comfortable with their current job as most enjoy working with their manager. Yet one in five (22%) expect to search for a new job once the economy improves. Importantly, additional data within the report clearly indicates these attitudes are changing given workloads. The fundamental question remains: are your employees at risk of leaving? 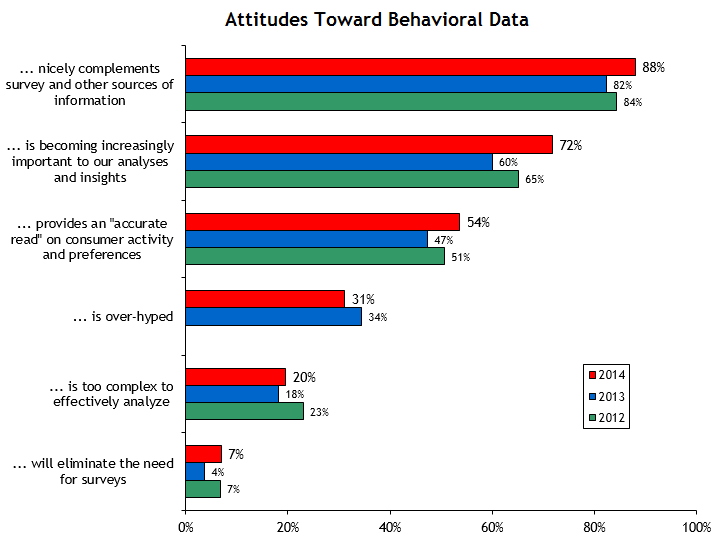 Researchers increasingly believe behavioral data is more important to analyses, complements other sources of information, and provides accurate insights into consumer activity and preferences. And with the growing interest upon "Big Data" analyses, the nature of the researcher's work is changing. The complete, in-depth report provides additional analysis and quantitative data. Below is a Table of Contents for the 2014 Edition of the Report. The in-depth report is available for $499. Visited monthly by nearly half of all market research professionals in the United States and possessing the resumes of more than 50,000 market researchers, MarketResearchCareers is your market research staffing headquarters. See why so many corporate hiring managers, human resource professionals, market research suppliers, and thousands of skilled researchers turn to MarketResearchCareers to fill their market research jobs. Please contact Mike Carroll at 1-800-872-5401 or mcarroll@marketresearchcareers.com for permission to use these results.